Q: What caused PM and Ozone pollution to spike so high and fast on Oct 19th that health alerts had to be issued from Dallas to Denton? A: The Texas Commission on Environmental Quality couldn’t care less. That’s the take-away from Peggy Heinkel-Wolfe’s story that appeared over the weekend in the Denton Record Chronicle. You may remember we reported on the mystery shortly after it happened and tracked down all the local and non-local suspects cited by officials in the media that day. None of them turned out to be the cause of an air pollution incident that was so potent it raised the entire regional ozone average a whole part per billion and forced PM levels into the triple digits. 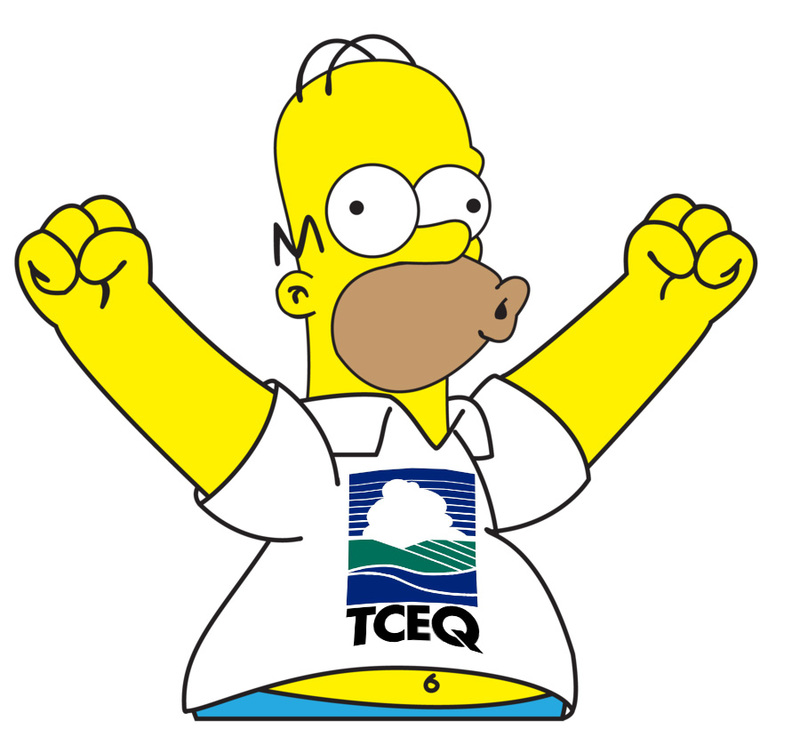 Heinkel-Wolfe goes one step further and makes inquires from the TCEQ itself. And the run around she gets is Catch-22 material. TCEQ says they can’t investigate an air pollution problem unless there’s a known cause. But if there’s a known cause, what you’ve got there really isn’t an investigation any more, it’s an enforcement action, isn’t it? This article may be the single most compelling case for why DFW needs its own locally-controlled air quality monitoring network. Find it here. Q: Where are the results of the air samples the Dallas Fire Department supposedly took when a West Dallas Recycling was sending large plumes of black smoke over the surrounding and downwind neighborhoods on December 11th? A: Nobody seems to know. 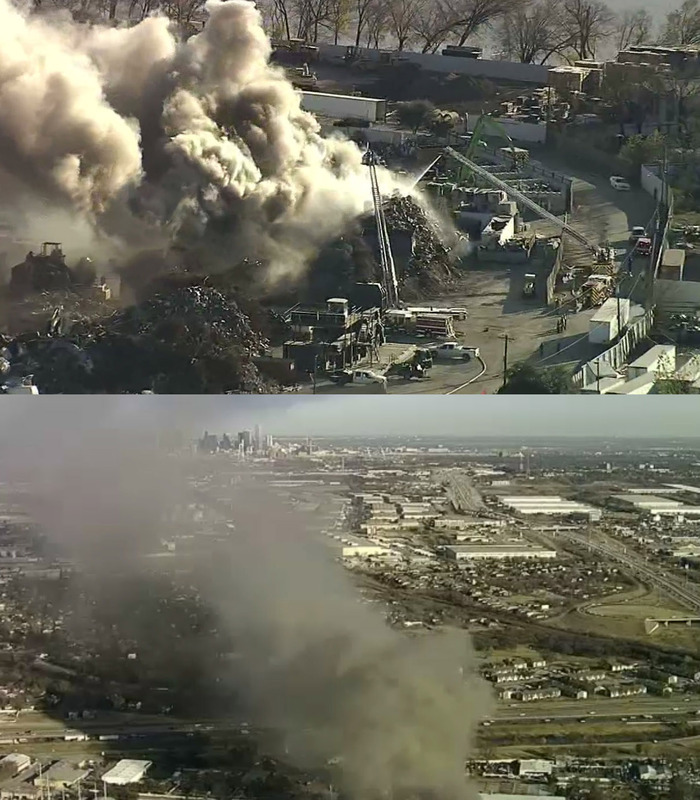 A huge pile of metal scrap burned and smoldered for over 24 hours at Sunshine Recycling on Ruder Street in West Dallas on December 11th. Thick plumes of smoke streaked the sky for half a day and into the night. According to WFAA-TV, a Fire Department Hazardous Materials response team was on site because there were hazardous materials on site – although exactly what those were, or are, remain nameless. But OK, you say you took tests and they showed nothing out of the ordinary? Let’s see them. In December Downwinders submitted a Texas Open Records Act request to the City of Dallas for the results of those tests. We’re still waiting. As of today, and despite three phone calls to the Open Records Division of the City Secretary’s office, we still don’t have what it’s supposed to take no more than 10 business days to get. It’s been a month and counting. We’re trying to get some legal help to extract the information. Stay tuned. For $500 a piece, we can install a dense grid of PM monitors across the region, tie them all together and present the information to the public in a transparent accessible way. It can be locally-controlled, directed by scientists, and independent of political influence. It would automatically track plumes in real time, not an hour ago. It would give you reliable and specific levels of pollution rather than vague reassurances. It would transfer the power from officialdom to citizenry. That’s the new Network we’re building. Stay tuned.